Some say the OORC is tougher than Robie! ​Check it out for yourself and you decide. Saturday, March 23rd, 2019 at 10:00 a.m.
Get off the road and into the hills! The breathtaking views and stunning Snake River Valley scenery from the top of the Owyhees are worth the climb. Mark your calendars! The 5th Annual Owyhee Off-Road Challenge is slated for March 23, 2019! ​off a new running season, offering great bragging rights and excellent training for other events later on in the year. From the park the route will take participants one mile south on pavement down Hwy 201, then will go Off-Road up into the hills, climbing over 700 feet to overlook the Snake River Valley. Mile three to four, runs out to the edge of Rimrock Butte for stunning panoramic-views of the Treasure Valley, before turning south, then looping across the ridge of the Owyhees, rewarding participants with fabulous views of the rugged Owyhee River Valley to the west. At mile 8.5, runners will face Swear Hill, a half mile stretch up an awesome sandy slope. Reaching the summit at mile 9, runners are rewarded with a gentle decline in elevation, and fabulous views for the next mile, which prepares them for the last climb at mile 10. From there it's all down hill. Once again, runners are rewarded with tremendous views, this time of the patchwork beauty of the Treasure Valley farmland as they make their way back to the park. Over 90 percent of the course is off pavement on dirt roads and trails. Easily, one of the most beautifully challenging runs in the Treasure Valley! Start the year off right: Take the Challenge! Both runners and walkers are welcome to compete. There is a time limit of four hours. We look forward to seeing you and wish you the best of success in your training. All participants will receive a high quality, long-sleeve, Leslie Jordan tech shirt. 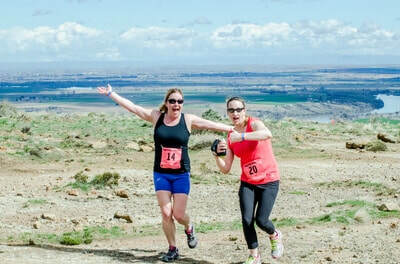 Don't miss out on the most beautifully challenging run in the Treasure Valley!